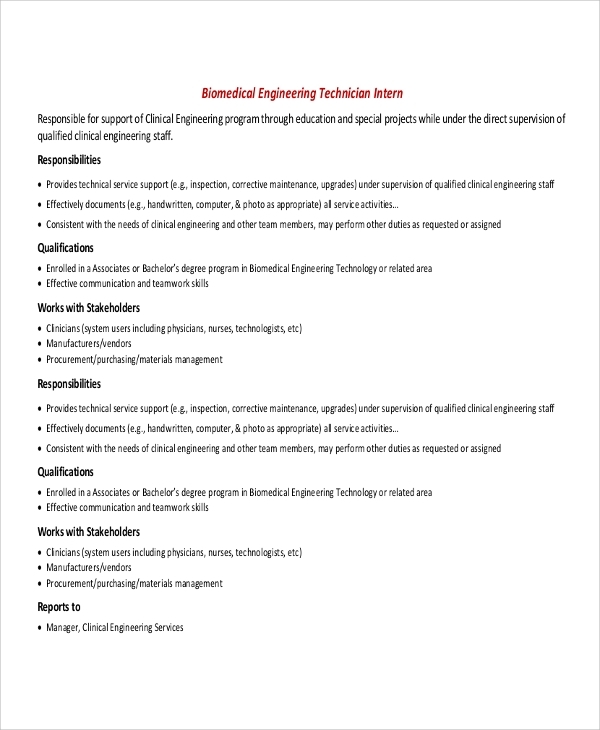 There are different types of jobs in biomedical engineering, and the following biomedical engineering job descriptions are ideally suited for all such jobs. They are complete and perfect, and companies can use them as a reference to prepare their job descriptions to get applications from candidates. 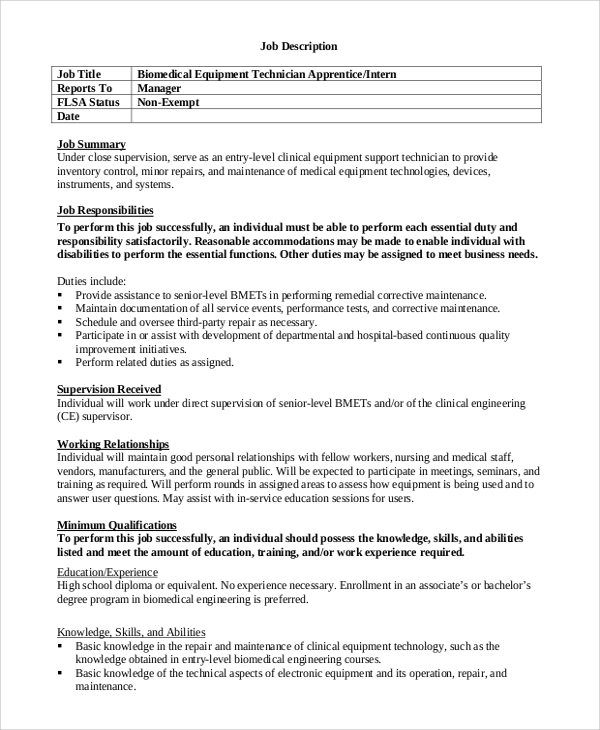 Candidates can prepare their biomedical engineer resumes following the requirements in the Job Description Samples and get a call for the interview. This is a perfect job description for a biomedical, clinical engineer. It describes the purpose of the position, responsibilities, qualifications and skills required, additional responsibilities, physical aspects of the position, timings and other necessary information one needs to know before applying. 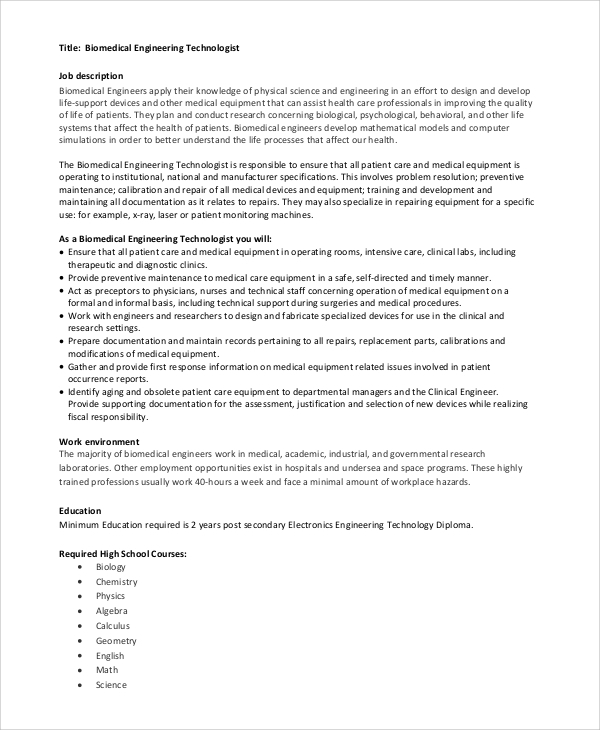 This is a complete biomedical engineering job description to hire a technician. It starts with job title, location, reporting, functional relationships, the purpose of the post, critical tasks, and their expected outcomes, behavioral competencies expected and skills and qualifications required. This is a job description for a biomedical engineering technologist post. It describes the importance of the post followed by the roles that the selected candidate has to perform, the working environment, education required, personal traits preferred, and other details. You may also see the Electrical Engineer Job Description Samples. A proper job description makes it easy for the candidates to understand the requirements of the job and whether they are suitable for the job or not. The above-listed biomedical engineering job descriptions are perfect and detailed from all the aspects, and they are useful for any companies or agencies to hire suitable candidates for a vacant or new post related to biomedical engineering. They can be used as a reference or can be edited to get the desired job description and spread it online and offline to reach the targeted audiences. 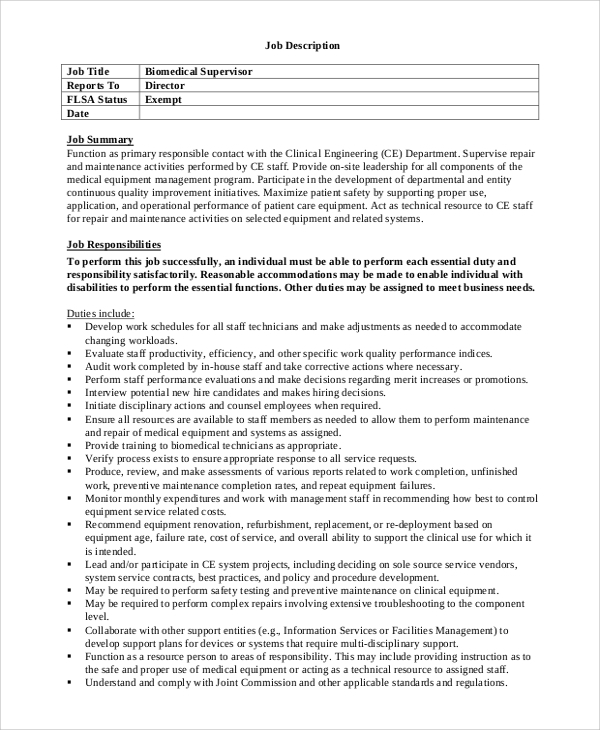 This job description for recruiting a biomedical engineering supervisor starts with job summary followed by job responsibilities. It lists all the duties one needs to perform including the additional ones, minimum qualifications, working conditions, experience and skills required. 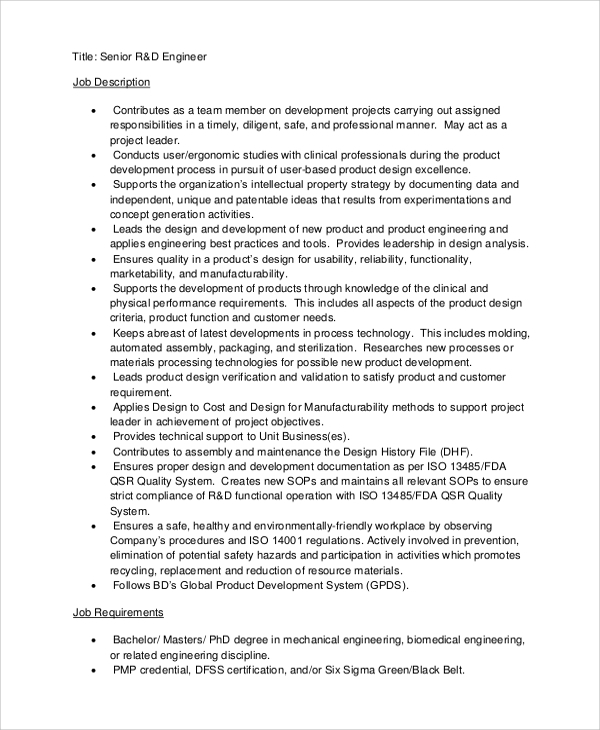 You may also see the Mechanical Engineering Job Description Samples. 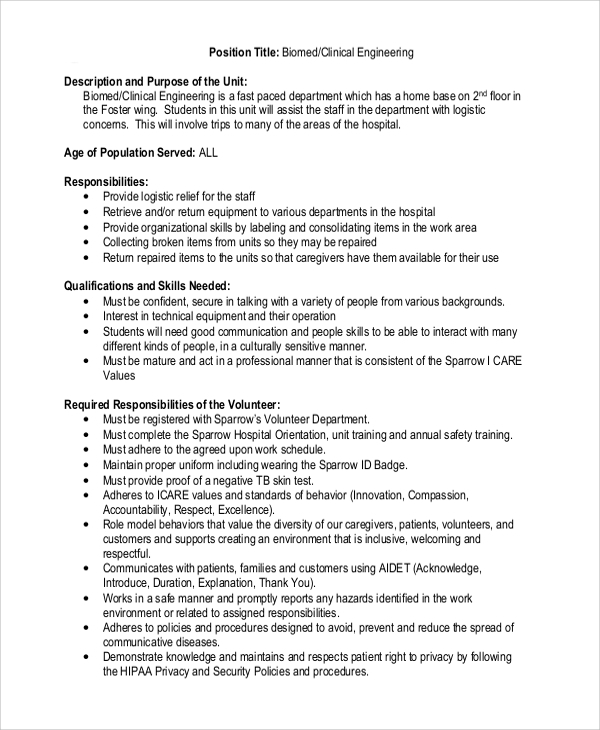 This is a job description for a vacant post of biomedical equipment technicians. It begins with a proper job summary and job responsibilities, and it is followed by a list of duties to perform, the working relationship to maintain. Then it lists the minimum qualifications, skills, and abilities required to perform the job smoothly. The targeted audiences for the job mentioned above descriptions are the biomedical companies, organizations, and agencies who want to hire biomedical engineering candidates in vacant or new posts. They are immensely helpful for the candidates to form their resumes accordingly to meet the requirement and tailor-made their resumes to highlight the relevant qualities to edge past the competitors. You may also see the Process Engineer Job Description Samples. The above-listed biomedical engineering job descriptions have the perfect format, and they cover all the necessary headings so that the candidates know whether they are eligible for the post and what is expected of them once he/she makes through the selection process. It is helpful for the companies and agencies to prepare a perfect job description for various posts in biomedical engineering. 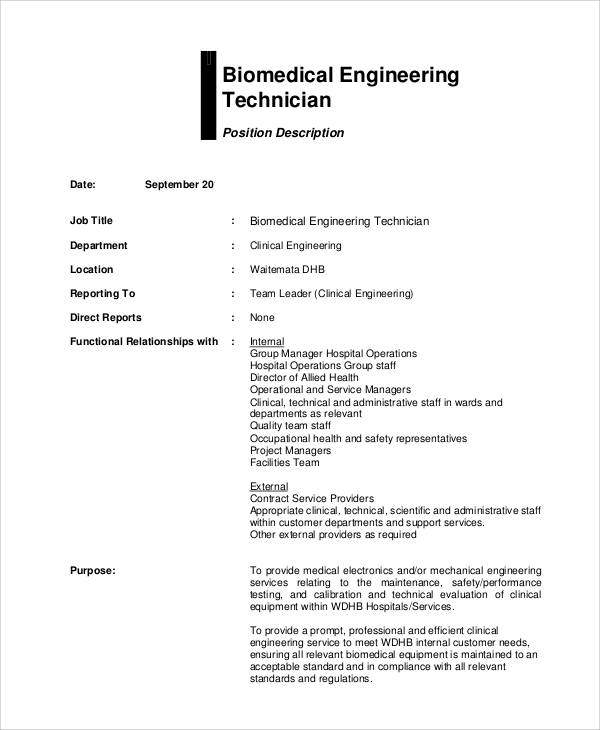 You may also see the Biomedical Engineer Resumes.